The trial begins Monday [10/15/18] and is expected to last two to three weeks. Affirmative action policies are back under the legal microscope. A group called Students For Fair Admissions is accusing Harvard University of considering someone’s race too much in the admissions process which, they argue, is making Asian-American applicants meet a higher bar. Students For Fair Admissions has several complaints about the admissions system at Harvard — from failing to consider race neutral admissions tactics to putting too much weight on race in the decision-making process. But the biggest allegation is discrimination against Asian-American applicants. The plaintiffs will be trying to prove that with a few key points. When you look at Harvard’s freshman classes, they appear pretty similar from year to year. The plaintiffs say that means Harvard is using a quota system or racial balancing, which would be illegal under federal law. Harvard denies that, saying race is one of many factors they consider. 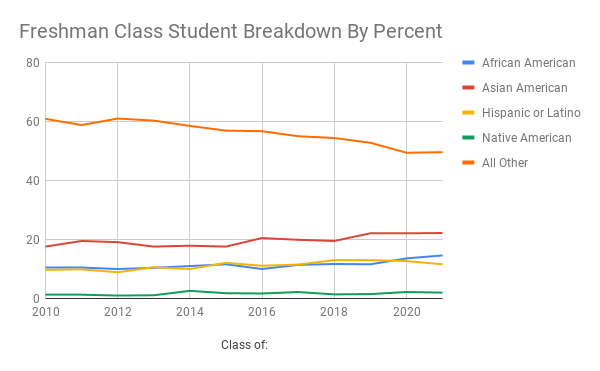 Admissions data WBUR reviewed shows that in recent years more Asian-American students have been accepted into Harvard’s freshman classes. The plaintiffs argue, if admissions were based on academics alone, Harvard would accept twice as many Asian-Americans. Take the SATs, for example. According to the plaintiff’s analysis, Asian-American applicants score an average of 25 points higher than white applicants, 217 points higher than African-American applicants and 153 points higher than Hispanic applicants. One of the biggest influences on their calculations in this debate comes from a 2013 report from Harvard’s Office of Institutional Research. In court documents, the university maintains that analysis was just a preliminary report. School officials like Dean Rakesh Khurana told WBUR it takes more than good grades to get in. Things like extracurricular activities, artistic ability and athletics factor in too. 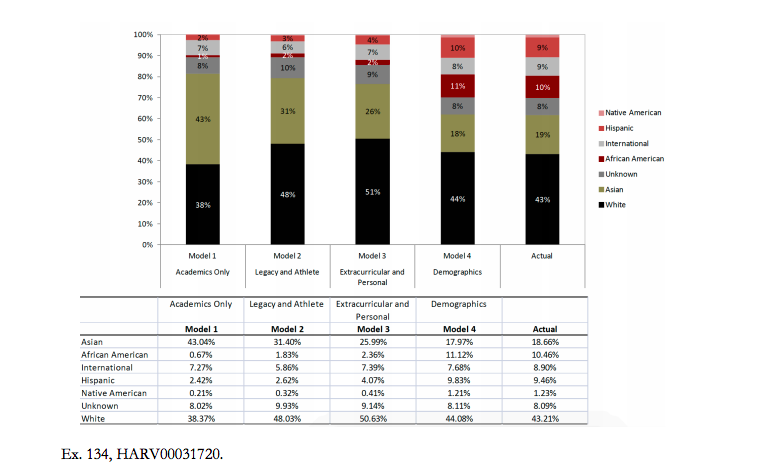 Harvard applicants are rated in four categories: academics, athletics, extracurricular activities and personal factors. The plaintiffs claim that Asian-Americans consistently get lower personal scores compared to other ethnic groups. But Harvard disputes that, and says the plaintiffs aren’t accurately considering how other factors — essays, letters of recommendation, public service, or facing adversity — are weighed in the admissions process. The president of Students For Fair Admissions is Edward Blum. This lawsuit against Harvard is one of multiple challenges Blum has made against affirmative action. He is not an attorney, but his group has filed a similar lawsuit against the University of North Carolina at Chapel Hill. Blum was also behind another lawsuit challenging race sensitive admissions, Fisher v. University of Texas. The Project on Fair Representation, an activist group Blum also directs, ultimately lost that case in the Supreme Court in 2016. In addition to his efforts challenging affirmative action, Blum was involved in the Shelby County v. Holder case. The 2013 Supreme Court ruling in that case struck down a provision in the 1965 Voting Rights Act that required states with a history of voter discrimination get federal approval before changing voting laws. Edward Blum declined WBUR’s request for an on-the-record interview, given the pending litigation. But people close to him, like Ilya Shapiro, a constitutional studies fellow at the Cato Institute, say the issues at the center of the Harvard suit go beyond Asian-Americans. Unlike Fisher v. University of Texas, the Harvard lawsuit was filed by an activist group, not an individual. That’s a factor that doesn’t sit well with some students, like Harvard senior Jang Lee, who thinks Asian-American students are just being used as a wedge. Lee submitted an amicus brief to the U.S. Federal Court in Boston in support of Harvard and the use of race conscious admissions. He’s also been working with the group Asian Americans Advancing Justice. But there are Asian-American groups on both sides of this issue. Lee Cheng is with the Asian-American Legal Foundation. He’s a 1993 Harvard graduate but supports Students For Fair Admissions in this argument. Cheng disagrees with the argument that Asian-American students are just being used for a political win. A lot of people will be watching this lawsuit to see how it plays out. Mary Sue Coleman, president of the Association of American Universities, worries that if Harvard loses this case, selective colleges in the U.S. will become less diverse. “Those experiences that students get from having students from different diverse backgrounds is good for all students,” said Coleman. But the plaintiffs and the Trump administration argue that schools can still get diverse classes without using race, and that Harvard hasn’t adequately explored those options. The Department of Justice has submitted a statement of interest in support of Students For Fair Admissions. Ultimately, when it comes to this decades old precedent allowing race to be considered in college admissions, legal experts say it’s likely the Supreme Court that will have to decide. Carrie Jung is a senior education reporter with Edify.